FEATURE — As the winter months approach and the mercury inevitably dips on the thermometer, it is important for homeowners to prepare their heating equipment to keep their homes safe and to avoid being left in the cold with a heating unit that isn’t working. Much like a regular dentist appointment or doctor check-up is needed to maintain a person’s health, a heating unit requires regular maintenance and inspection to continue to function safely and efficiently. For homes with a natural gas furnace, Jason Tanner, the branch manager of Triple-T Heating & Cooling in St. George, recommends a 32-point tuneup and inspection. 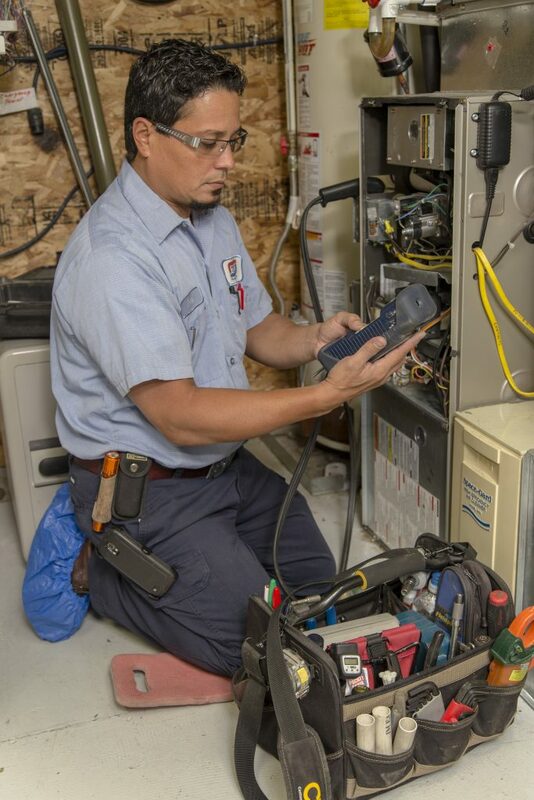 A licensed technician performs the tuneup, which includes adjusting the gas pressure for the altitude, checking carbon monoxide levels to make sure they are within the guidelines of the state, cleaning the unit inside and out and checking that all the safety devices are functioning properly. The inspection generally takes about an hour, Tanner said. When the inspection is complete, the technician can print out an efficiency report on the unit which shows the homeowner how effectively their furnace is working to heat the home. The report also shows a comparison of the unit’s efficiency both before and after the tuneup and inspection. An efficient heating unit can save the customer a fair amount of money in heating costs, Tanner said. “Many times, the savings in the efficiency will actually pay for the tuneup,” Tanner said. Additionally, the technician will check the home’s carbon monoxide detectors to be sure the batteries are good and that the detector is in working order and in compliance with current safety guidelines. Many carbon monoxide detectors only last about five years before they should be replaced, Tanner said, so regular inspection of the detector is essential to keeping the home’s occupants safe from possible carbon monoxide poisoning. Homeowner safety is an essential reason to get a yearly inspection on the heating unit, Tanner said. Often homeowners will have older units that could have developed cracks in the heat chamber, allowing gases to escape into the home, which is extremely dangerous and potentially fatal. If done thoroughly, routine maintenance and inspection of the furnace can find issues and repair or replace the unit before the malfunction becomes hazardous. For homes with a heat pump, Tanner said it is also very important to maintain the unit on a regular basis. Simple tips like maintaining the Freon levels can go a long way toward efficient heat output and saving money on heating bills. Another tip Tanner gave for homeowners with a heat pump unit is to regularly change the filters. For heat pump maintenance, Triple-T’s technicians will come into the home, check the Freon charge, change the filter, clean the unit and check additional safety features. Tanner said the company does just as many heat pump maintenance appointments as they do gas furnaces. Triple-T Heating and Cooling is a three-generation family business that began in 1974. The company has two locations in Utah: the corporate office in Utah County and the Washington County location. The company’s primary focus is on the service, repair, maintenance and replacement of heating and air conditioning equipment in both residential and commercial existing buildings. The Utah County location also does plumbing. Triple-T Heating & Cooling has highly trained and educated technicians. Where the state requires minimal qualifications to be a technician, Triple-T typically requires their employees to have completed a four-year degree and have federal license journeyman status, Tanner said, making them a more competent and thorough technician. “We care about the homeowner and their home,” Tanner said. Triple-T Heating & Cooling offers a 12-month warranty on all repairs. Operating hours are Monday-Friday, 8 a.m. to 5 p.m. Triple-T also offers 24-hour emergency service with live answering. Tanner said no matter what time a customer calls, they will be able to talk to a live person and not a recorded voice. Triple-T Heating & Cooling services the Washington County communities of St. George, Washington City, Hurricane, Santa Clara, Ivins, LaVerkin and Dammeron Valley. They also provide service to Cedar City, Springdale and Kanab for an additional fee. For more information about Triple-T Heating & Cooling including pricing, financing and seasonal specials, visit their website. Triple-T Heating & Cooling, 815 Red Rock Road, Suite 9, St. George | Telephone: 435-275-4011 | Website | Operating Hours: Monday-Friday, 8 a.m. to 5 p.m. with 24 hour emergency service available. Although some of these tips could be useful, this article is nothing but a blatant ad for one company. You should not publish “articles” like this. They are not believable when we think it’s just paid advertising. Oh, down at the bottom, you put “SPONSORED CONTENT.” That is not news. Stop trying to be deceptive with us.